The Vincent Tshabalala Education Trust is an initiative of the comrades and school friends of Vincent, who wanted to recognize his contribution, honour his legacy and ensure that his memory lives on and inspire generations of young people from Alexandra. 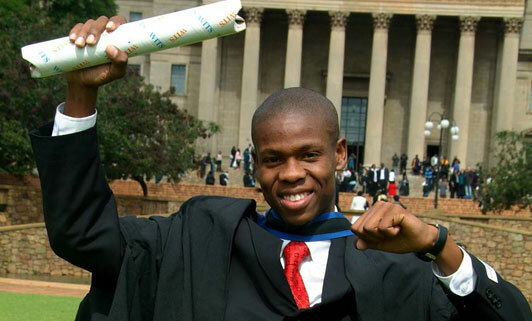 The education trust has become a fitting tribute to this young and courageous soldier of the Umkhonto We Sizwe, in recognition of his commitment to an equal & better education and to the struggle for a better South Africa, click here to read more. Thank you for your contribution and consistent support of the Vincent Tshabalala Education Trust Annual Fundraising Golf & Dinner. Our Achievements of more than 13 Years of community service can be attributed to your generosity and commitment over the years. We are continually humbled and appreciate your invaluable contribution in enabling the children of Alexandra to realise their dreams. Thank you for enriching lives. Vincent Tshabalala © 2011 - 2012. All rights reserved.